We had VBS at church this last week. VBS is always a fun, busy time. There’s something about seeing all those eager-to-learn smiling faces that lights a fire in my soul. I think we adults need VBS just as much as the kids do. Their enthusiasm helps shape our motivation. My first real church memory from childhood is a VBS memory. I didn’t accept Christ that summer, but that’s where I learned to trust those strange churchy adults. That trust played a major role in my willingness to listen at a later date when one of those adults talked to me about Jesus. So while I wasn’t saved at VBS, I still think it played an important role in my childhood and, ultimately, in my salvation. I can imagine some the many different directions my life could have gone without Christ, and I’ll be forever grateful to God – and to the adults who followed His lead – for loving me enough to invest in me and show me a better way. The best way, really. What about you? Do you have any good VBS memories (as an adult or from childhood)? Does your church do VBS – and if it does, is there anything special you do to help? Wishing everyone a marvelous week! 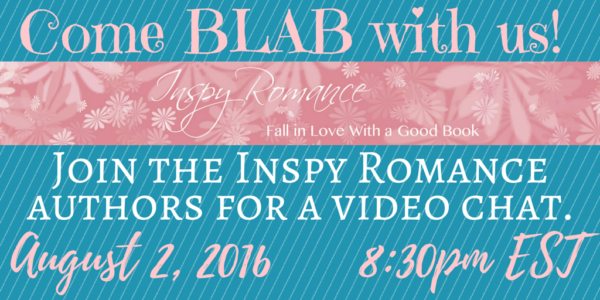 The Inspy Romance authors are talking new releases. Sign up now to join and receive notifications about our August BLAB. Do you know what time it is? If you’re new to Inspy Romance, you may not. Twice each year we have a month-long giveaway. What can we say? We like giving away kazillions of prizes. It makes us happy. 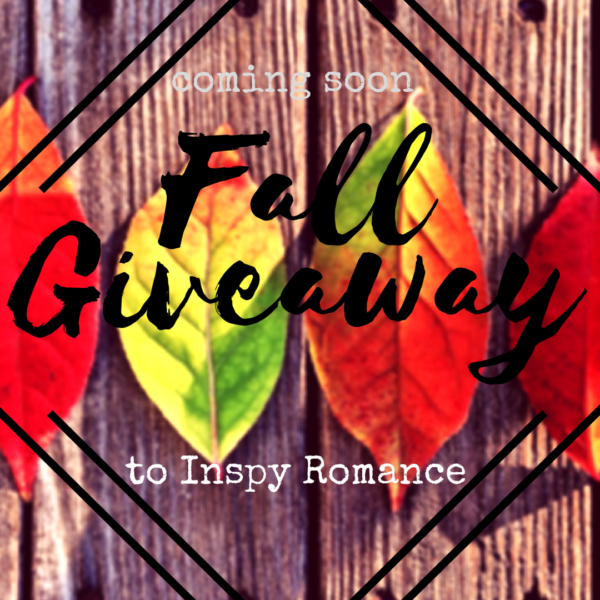 And our Fall Giveaway is coming up soon. Watch for all the details in next week’s Sunday Edition! kathleenefriesen is the winner of her choice of one of Merrille Whren’s reunion romances from Merrillee’s post Reunion Stories on July 25th. kaleen21 is the winner of A Christmas Potpourri from Debra Lynn Collin’s post Christmas Potpouri – Vol. 2 #giveaway on July 27th. Monday: Merrillee Whren talks about her 50th class reunion. Tuesday: Sally Bradley gives us a book recommendation. Wednesday: Debra Lynn Collins celebrates Christmas in July. Thursday: Heather Gray asks about kissing and temptation. Friday: JoAnn Durgin shares a love letter to her son. Saturday: Autumn Macarthur broaches the subject of how God speaks to us. Hi:) I grew up going to Adventurers, then Pathfinders (VBS but with a different name). The relationships formed with others my age and trusted adults had a huge impact on my life and my decision for Christ. I credit my involvement with these as keeping be sane during my teen years. A fun memory I have is from one of our weekend campouts, we were practising our knots and building skills. We girls had somehow managed to raid the boys tents and steal their unmentionables that we then flung from a catapult into the prickles!! Hehe, while there was payback (in the form of a food fight!!) we felt rather smug with both our catapult building and our “skills” at absconding with the boys clothes. Good morning! As a child, I attended VBS. I enjoyed the Bible stories and crafts. My favorite part were the missionary stories. From our area we had a Japanese missionary, Miss Miller and so we learned about the Japanese culture. When I was a teen I told the missionary stories at VBS. One year I did Japan, explained boy’s day and girl’s day. Because of Miss Milller and her life in Japan, I applied and was selected to a 3 week Fullbright Study trip for teachers in Japan in 2008. Now as a retired pastor’s wife and teacher, I take my three grandchildren to VBS. In our area the churches do several different programs and have VBS at different times, some during the day, some in the evening; giving children and adults opportunities to participate in VBS. What a wonderful testimony of your faithfulness to God and His faithfulness to you! And what a blessing that He used the relationships He fostered through VBS to give you such amazing experiences. Thank you for sharing Renate! We had VBS this week , too. :) Lots of fun, I look forward to helping every year. I hope God blessed your church and all the adults and children participating in VBS! I think I’ve asked this before, but is anyone else having trouble listening to the blab recordings afterwards? I teach on Tuesday nights, but have tried to listen to June and July’s blabs a few days after without success. You do have to sign into blab (either via twitter or facebook) in order to see the replays but otherwise it should work. If you are signing in and it’s still not working, I might try and see if there’s a contact from on blab that you can use. It looks like everything that we’re able to control is set up as it should be. Sorry! I’ve tried to sign in using Facebook, but it never got through. I’ve email their bug support, but I was wondering if it was just me–now I know that probably is. I’ll wait for their reply. Thanks so much for hosting the Sunday Editions in July, Heather! You are much appreciated. I remember helping run VBS on reservations as a pre-teen. My dad was a missionary to the First Nations in northern Manitoba, Canada. We’d spend a week in each village, often sleeping on the floor of the school or church we were using for VBS. While in college one summer, I worked for Rural Bible Mission and did 20 weeks of VBS. We used flannelgraph. Our local library uses flannel-graph as visuals in their preschool story time for counting and color recognition – 5 ducks or flowers, etc. It often is used to summarize a story read. Our church had VBS a couple of weeks ago. My 15 year old son is part of the skit crew and I’m a behind-the-scenes Mom doing lights for the skit, making food, and helping with supplies. Last year he was a lab assistant. This year he played a “bad guy” for the first time: Mr. Octopus. The crew did a great job and the kids enjoyed the nightly skits. Since last year’s VBS, one kid at church continues to call my son “Sam”. He is making a difference and impacting young lives. God is so good. Thank you for visiting today Julianne and sharing your story! How awesome that your son takes active part in VBS! I often think that it’s through the activities our teens choose (rather than the ones we choose for them) that we get to see into their true heart. What a blessings that your son is choosing activities that both honor God and help others to learn about Him! I remember going to VBS as a kid. My family attended a Lutheran church, I can’t say I remember anything about the VBS per say, but I’m sure I was excited to go. There was always some good activities. Growing up I didn’t go to a vacation Bible study but my daughter went to a really good one close to home a few years ago! !